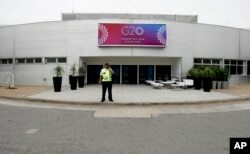 A jetliner flies over the G20 summit venue at the Costa Salguero Center in Buenos Aires, Argentina, Nov. 28, 2018. "Whoever wants to demonstrate must do it within the confines of peace and freedom of expression. 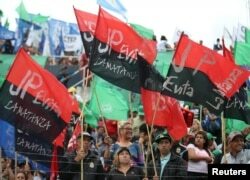 Not violence," Bullrich said. "Whoever crosses the line, will have to face the legal consequences."